As reported late last night on The Guardian Online, Gary Gygax, co-writer of Dungeons & Dragons, has died. Say it isn’t so! What a sad day. Gary Gygax has no idea how much he influenced my childhood. I’m proud to say that I still have my original AD&D Player’s Handbook and Dungeon Master’s Guide. From time to time, I crack them open, taking myself back nearly 30 years in time. Those books truly were a work of art (and, you may recall, dungeon mastering is both an art and a science). I can only imagine how different I would be today if I never found them. 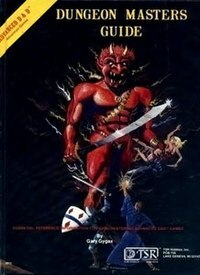 Without a doubt, Gygax’s skill as a writer advanced my reading skills by leaps and bounds, and the countless hours I spent in the worlds he created enhanced my imagination. I have a funny feeling I’ll be browsing through those books tonight, just for old time’s sake. Good night, Mr. Gygax, and thanks for all the memories. My Illusionist’s Phantasmal Killer tips his hat to you.